In 2009, Brarenbrug’s innovative research and development team introduced a unique, one-of-a-kind perennial ryegrass subspecies to the turf industry, RPR®. In January 2015, RPR received a utility patent #8,927,804. With recognition as a new turfgrass distinctly different than traditional perennial ryegrass, Barenbrug’s RPR varieties are now the first and only true turf-quality stoloniferum ryegrasses available. Tolerating extremely heavy traffic with outstanding recuperative abilities, RPR provides excellent turf quality and appearance. Far outperforming traditional perennial ryegrass, RPR provides traffic tolerance with early establishment. Resilient and tolerant of tough summer conditions, when perennial ryegrass is the turf of choice, RPR is the ideal selection for your sport and recreational turf facility, golf course and active home lawn. 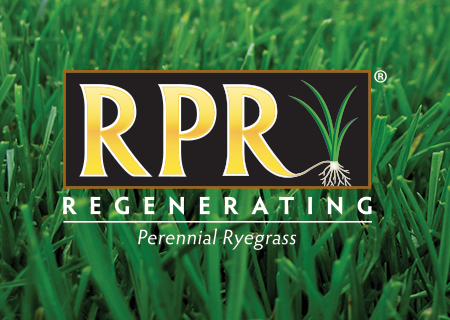 RPR’s unique ability to regenerate separates it from both traditional and lateral spreading perennial ryegrasses. A product of advanced DETERMINATE-STOLONS breeding techniques, RPR develops determinate-stolons which allow for regeneration in all directions. Determinate-stolons arise from an auxiliary bud near the base of the mother plant and then grow horizontally 6-8” at, or just below, the soil surface, creating identical new plants as they grow. When RPR turf is damaged from an extreme traffic event or worn from persistent traffic, its determinate-stolons will grow horizontally into the worn areas, develop roots and rapidly repair the damaged area. The photos below show RPR plants, determinate-stolons and developed roots. Protected by patent #8,927,804, RPR’s patent includes 50 statementswhichcovervariousaspectsincludingdeterminate- stolon counts, crown perimeter and a determinate-stolon index. Other companies have claimed similar levels of performance from spreading perennial ryegrasses; these other products, however, do not produce determinate-stolons and are not capable of regeneration after severe traffic. Barenbrug extensively tests all of its varieties and RPR is no exception. It has exceeded the company’s most stringent quality requirements for traffic tolerance, speedy recovery, drought tolerance and turf quality. RPR first drew the attention of turfgrass plant breeders at the Barenbrug research site in Virginia where new grasses are developed for traffic, drought and cold tolerance. Researchers noticed that RPR was thriving under verydifficult conditions, producingdeterminate-stolonsandrecoveringin areas of highest traffic stress. With the best plants selected, continued development of RPR was performed at Barenbrug’s turf research center in Oregon. Utilizing the technique of space plants and frequent mowing, Barenbrug’s turfgrass breeders studied the lateral growth of RPR comparing it to a typical perennial ryegrass blend. Repeated seedings over the entire playing surface with RPR plus Yellow Jacket coating produced a steady improvement in overall turf quality. RPR has literally been a life saver. Since its introduction in 2009, RPR has proven to be a strong, durable performer. As is common with success, several other seed companies are now claiming similar levels of performance from spreading perennial ryegrasses. These products, however, do not produce determinate-stolons and are not capable of regeneration after severe traffic. RPR is so unique, it is recognized in a category of its own – Lolium Perenne ssp. stoloniferum.